Core Skills Loop – Many clients look quizzically on when they first see MTB Instruction’s core skills loop set up interwoven in the trees as a mini trail, as preconceptions would say “it’s not obstacles you would see on most trails?” MTB Instruction has developed this over the last seven years as a coaching & assessment tool prior to heading out on the trails and more importantly assuming the riders abilities on a bike. This condensed skills loop offers the client a chance to practice and enhance their bike handling skills in a controlled environment and offers the coach a first-hand assessment of the rider’s abilities and most importantly it’s FUN! Core skills starts with basic “finding the center of balance points” Track standing basically made fun by (slow racing) or (circle of doom) type games. Move this on to a slalom course and round-a-bout session. “Why – What does this give me?” This offers a client a chance to practice slow control, balance characteristics, body position, brake modulation techniques and rolling speeds. These basic techniques are at the core of any poised confident rider but are seldom practiced. We gradually push the client by introducing the (balance boards) section these are raised boards about four to six inches from the floor and scaffold plank wide. “Why do we need these, what do they offer me on the bike” Basically again it’s forcing the client to use the attack position, forces use of balance and the use of your body position so it’s not static on the bike. This also enhances confidence at approach to obstacles, and visionary aspects, breaking techniques. The boards can then be adapted to offer clients step up’s & step down scenarios and angled boards again testing the skill of the rider/s, the emphasis always being on “You being in control of the bike”. 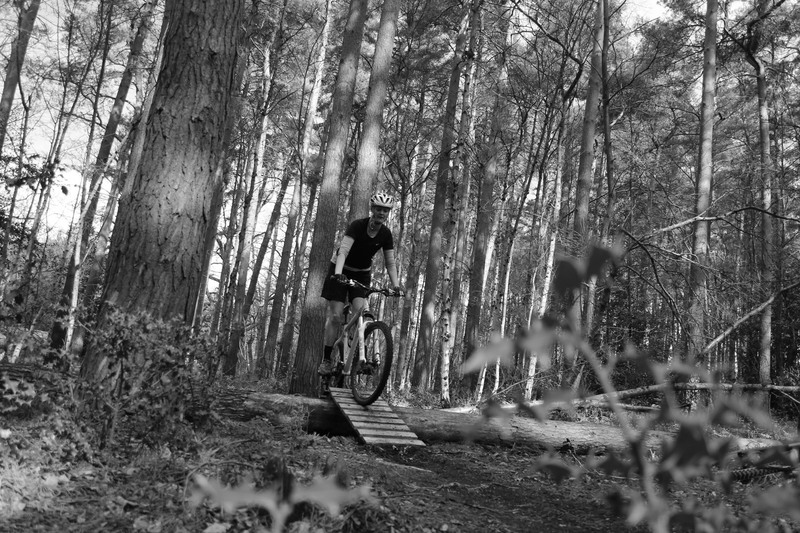 The loop is a mini trail, tight and twisty with obstacles inset to test the rider/s core skill set all the way around. Inset logs “what’s this for?” We set a section with inset logs strategically spaced to enable a rider/s to experience the sensation of rough terrain, roots and enhance attack and controlled aggression to drive through the section. Shore section “Why am I riding this?” We added a shore ladder section as part of the trail that offers an up & over a fallen tree obstacle. You will find sections out on trial centers so this can help with your confidence in riding boarded sections “Shore”. This can sometimes faze riders, but with our coaches on hand we can get clients to overcome those fears & anxieties, in turn building confidence, approach, body position, gearing. We utilize this section for advanced techniques removing the down section to offer a small drop off/step down scenario “Getting air” basically. The final section is our famous “See-Saw” section once mastered it’s a whole lot of fun. “What does this give me as rider?” For those proficient with the board sections they like the test this offers technical wise. Again confidence, balance, approach, mind set and for those who want to experience the sensation of a manual. Coaches are always on hand to spot until the confidence is there for the rider to attack the obstacle. We also like to force riders to drop off the side of this again forces the rider to get off the back of the bike thus mitigating forward momentum over the front of the bike, another sensation and experience on the bike. So link all these elements together as a loop and after a few sessions run it as one fluid mini technical trail. You’re then prepped to hit the trails and our coaches can tailor the day around your skill set, in essence you could touch all of the desired coaching levels in one day!